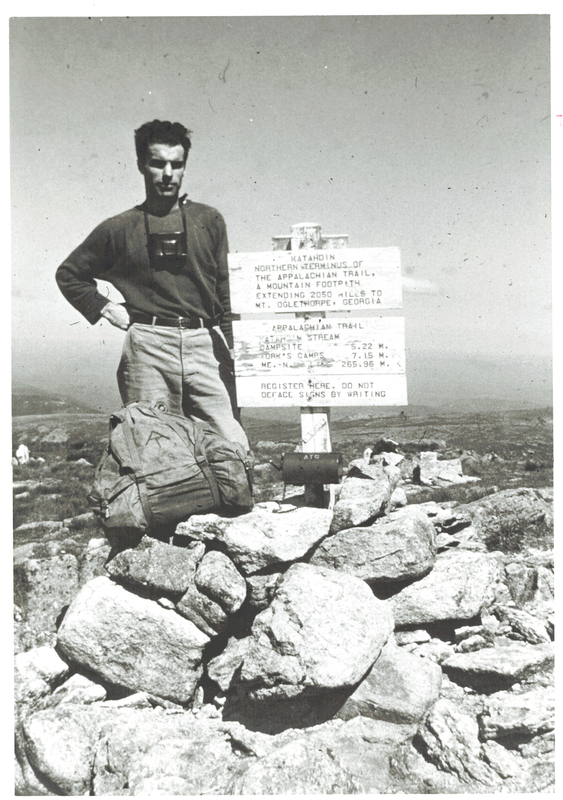 The bit of Appalachian Trail history that was made in 1948 was the appearance of the first “thru-hiker,” Earl V. Shaffer of York Springs, Pennsylvania, who reported completing the entire 2,050 miles in an uninterrupted backpacking trip beginning April 4 and ending August 5. Shaffer had lost his closest friend while they were in combat in the Pacific Theater and was “walking off the army” by “walking with spring”—the title of his book about it—along the Appalachian Trail he had read about in a magazine. While he was halfway to Maine, the already legendary Myron H. Avery was presiding over the Appalachian Trail Conservancy’s first postwar, regrouping meeting, at Fontana Dam in North Carolina—part of which was devoted to a discussion on how unlikely a thru-hike would be. The chairman was particularly disturbed that Shaffer had no official guidebooks and maps; Shaffer, “The Crazy One” as he called himself, said he wrote for but never received them so instead used oil-company maps and whatever he could pick up at parks and forests along the way. Shaffer’s account is still accepted as the first reported thru-hike; the ATC neither investigates nor endorses such reports. After he reported his feat to the ATC, Shaffer underwent at least one “charming...grilling,” as he would later put it, primarily by editor Jean Stephenson—place questions, people questions, photographic evidence, Trail-condition questions. After that, she and, through her, Avery would accept the report. Stephenson did note two “off track” sections, which Shaffer acknowledged and blamed on poor signage or unmarked relocations during that recovery period. Shaffer hiked the Trail again in 1965, from the other direction, and once more as a 50th-anniversary trek in 1998 at age 79—complaining bitterly all the way about route changes from roads up to mountaintops away from towns. He was named president of the York Hiking Club after his first hike and, once he had satisfied Avery and Stephenson, was appointed ATC corresponding secretary, providing advice to would-be hikers of all kinds and taking a burden off Washington-based volunteers. Although he had stayed away from Trail functions after a dispute with NPS land-acquisition workers in the 1980s, he resumed his involvement in the mid-1990s with standing-room-only shows of his slides (accompanied by his poems and songs) until a final, extended illness hospitalized him in 2001. He died in May 2002. He would have been 100 this fall. Shaffer’s hike drew at least two lines across the story of the Appalachian Trail. Although then, as now, more than 99.9 percent of the users of the Trail are day-hikers and groups of two or four for a weekend or week—or club members out for an overnight—the notion was forever gone that a single backpacker could not walk that whole distance in a continuous hike. The second break in pattern reflected that human recreational achievement. Shaffer garnered publicity throughout the country’s major news outlets and then a full-length article in National Geographic about him and the Trail. From then on, local and national publicity about the Trail shifted markedly from the achievements of the “recreational maintainer” to those of recreational thru-hikers, although their numbers would not be significant for another quarter-century.